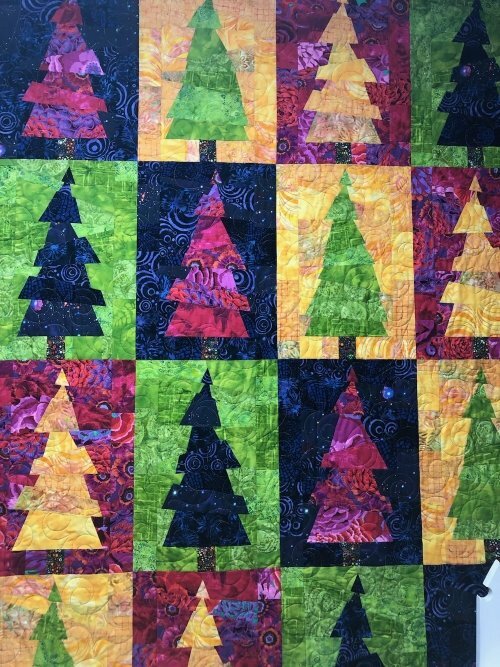 Another one of Karla Alexander's stack, slice and shuffle patterns, The Tree Farm is quilting entertainment. Perhaps most interesting for me was picking the four colors I wanted to work with and then finding four fabrics in the same color for each of those original four selections. Think Christmas colors red/green/white/gold or fall colors mustard/burgundy/green/beige (or black instead of beige for more drama) or something more muted like the black/blue/gray/?black and white? colors shown on the pattern. Different ways to sort the cut fabrics make the trees as smooth (the green trees on the yellow backgrounds) or as wonky (the red, yellow and blue trees) as you want. The quilt is a wonderful experience in color as well as just plain fun to make. A paper template for the triangle cut will be provided.